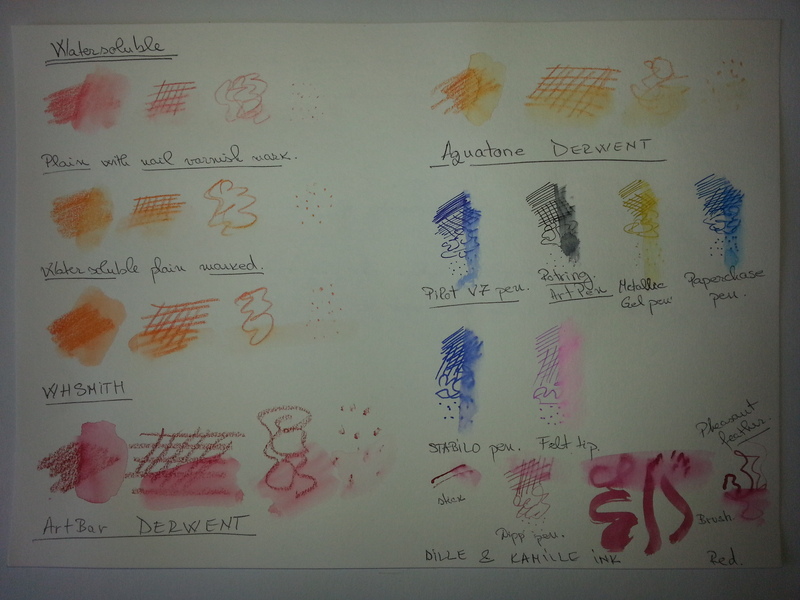 Inks are very expressive, have the advantage to be predictable (art pens) and non predictable (dip pens). If soluble, ink is very forgiving, but non soluble inks are permanent and they cannot be easily erased. All mistakes will show through. For stippling technique, is best and obvious to use non soluble ink. This is a time consuming way of drawing but a very delicate and rewarding effect. Pen and wash is a beautiful way of depicting any subject. This is one of my favorite techniques. The softer there are the more messy it becomes when using them and there are not designated for creating fine detail. there are ideal for suggestive work. A significant advantage is the fact that they are easy to apply and they can cover large areas of paper in seconds. A large variety of hues is available in this media. Hard pastels are less messy and ideal for placing the initial drawing of a composition. Not ideal to use them for entire large drawings. At the moment I am not familiar with the use of these. From hat I have tried so far , I have noticed that there are highly pigmented, the good quality ones are easy to apply, ideal for resist techniues in mix media work. Not suitable for very fine marks. Look forward to find out more about this media. For this project I have enjoyed experimenting, trying different media. I consider myself lucky to be able to buy all the required materials for this module. 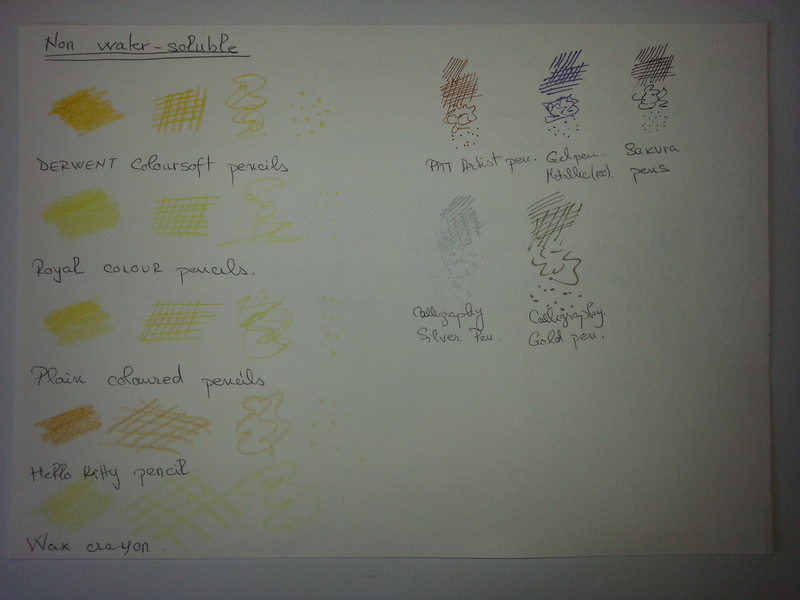 I have started this exercise by exploring the ualities of different colour media in my Sketchbook A4 no 2. The course requiers to comment on each media, looking at all pros and cons. When flicking through the above mentioned sketchbook, I have noticed that again, my disorganized style was taking over and I wasnt happy with he result. On each of these samples I have made pen notes about the used materials. As a result, I will have to redo the assignment pieces, which my tutor advised me to send in the same time with the work for assignment 2. How do I feel about this result? I have felt very sad and even now, ashamed to put this situation in here, making it public. But its better to wake up now than later. The first module, Painting 1 I have passed, but not with the best results. When putting everything togheter for assessment I have realised how disorganised I am and it was hard work to draw a fluid journey to lead the assessors through my work. It must of been a struggle to look at my work. I ended up writing in 10 A4 Learning logs that made my parcel overweight and I had to decide which one was less important, giving up on sending two of them. For this reason, I have included less information and less comments in the Drawing 1 learning log which abviously, like the tutor advises, it is not good enough. The excessive use of watercolour it comes as a result of trying a media that I never considered one of which I will enjoy using. Abviously I overdone it and that affected the quality and the level of my work for this course. The watercolors now are put away for me not to use any longer. Another reason why my work resumes to reasonable attempts and try outs that are litle tentative is because of my disorganisation and very little time that I have allocated to the coursework. Now I realise that without drawing every day it will be impossible for me to get the work done so I have commited myself to do it. The biggest improvement in my learning log will be building up this blog which allows me to organise my work better and committing to show my progress by posting at least three times every week. I trully apologise to my tutor for such a disappointing start, I could have done better and I am very grateful for receiving such a constructive feedback. I have received my tutor report for the first assignment of the Drawing 1 module. Full of constructive criticism, the report came across as a wake up call. Working towards a degree requires much more commitment and enthusiasm. I seem to misunderstand hat the course really requires when it comes to certain exercises. I have used far too much watercolours without showing successfully tonal variation and drawing techniques. A radical change in the way I approach the work for this course is necessarry. A thorough, investigative way of studying the subject, looking hard and interpreting through mark making, tone and texture will help me to produce better work. Using mostly charcoal and graphite pencils is the best way to show good tonal distribution and paying attention to texture, light source and composition I should be able to achieve better quality drawings. 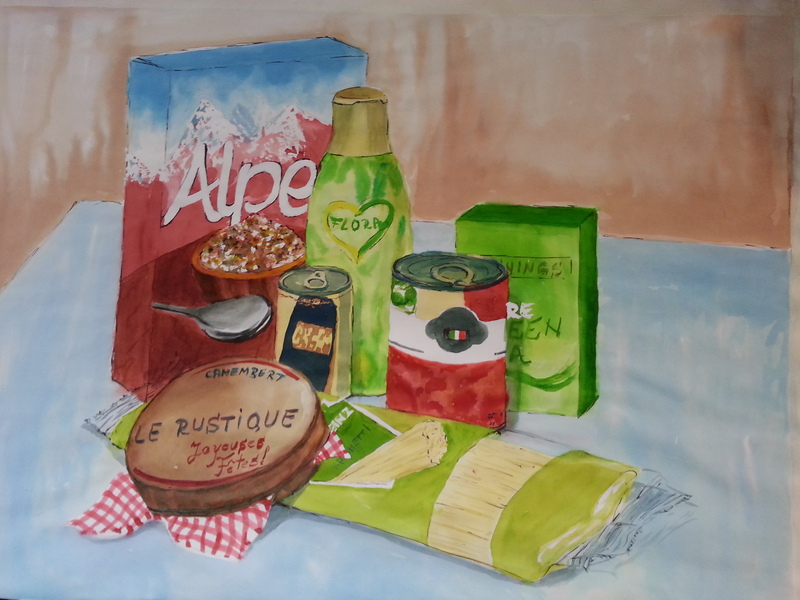 This image is what I have produced for the Supermarket shop exercise. My intention was not to copy the student example but because it was there I think that influeced my decision on what to use for this task. 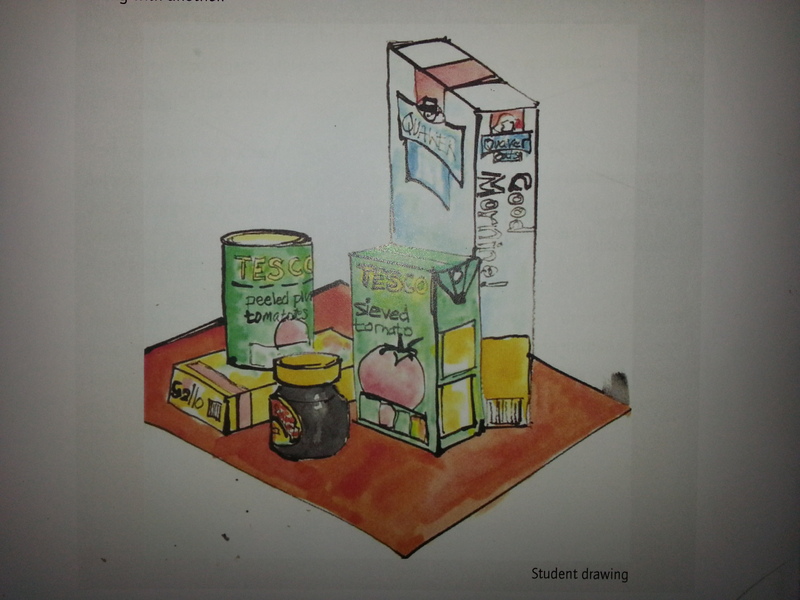 The tutor says that this is overly concerned with irrelevant detail in the packaging and it would of been preferable to use pastels and show the relationships between objects and tonal variation. I will tr from now on to focus more on the course material and not let myself influenced by the images included. My tutor says that overall ,I show some potential but I have to harness and exploit my capabilities sooner rather than later. This is where I will record my progress as an art student with OCA. I start this to follow on my tutor s advice, to become more organized and present myself as an art student, in a professional way. I hope that this will bring me more than showing how I get on with my work towards the Painting Degree. Hopefully this will be a way to discover my full potential in all the aspects of my life. Now I am learning to draw, but I think that I need to learn more about myself. That s why I have started the course in the first place, my need to discover the insights of my soul could not be better or more accurate revealed than through being free, creative and happy. My Blog: It's not just about the result...it's the journey! A brand new form of brain damage!